Trading in an older vehicle on a new one seems like a perfect solution for several problems at once. The idea of driving to a dealer in your old “beater”, signing a few pieces of paper and driving away in your dream machine is a pretty attractive scenario. But it’s not quite that simple. That’s likely the most common question people ask when considering a trade deal. And it’s not an easy question to answer. The bottom line is: there are a lot of deciding factors. The overall value of your trade will come down to several details: how old is the vehicle? What is its mileage? Is it a popular model? Is it a popular colour? Does it have a manual or automatic transmission? Is it in need of repair? Is there rust? Is everything in good working order? Are you still making payments on it? Dealers want vehicles in good shape that have been well cared for and that have a reasonable number of miles on them. They want service records. And they want popular models that are easy to re-sell. They don’t want rusted out, gas-guzzling, vehicles that wear the badge of a known “lemon” (i.e. Yugo) or a now extinct brand or model (i.e. Oldsmobile, Mercury, Saab). Those are tough to re-sell. If your vehicle is well worn, or displays rust, or needs a lot of repairs, or was never very popular to begin with (or all of the above), then neither scenario (trading or selling privately) will produce a great amount of trade or sale value, so consider just enjoying the convenience of having your dealer make the old beater disappear with little or no stress to you. NOTE: If you own a specialty vehicle that people would consider “collectable” or unusual for any reason, you will likely have to sell privately to get the most value out of it. The general public – which is the target market for a dealer – will not likely appreciate what makes it special, so don’t expect them to pay top dollar for it. If you demand the absolute most for your trade, then selling privately may be the way to go. When you sell privately, you are in control of the transaction. 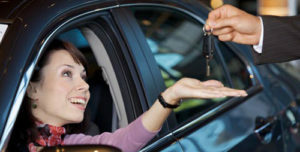 You can set the price at whatever you feel the vehicle is worth to you and you get to sell the car for its RETAIL VALUE. The downside is that no-one enjoys the hassle of selling privately. You need to arrange to show the vehicle, fend off “low-ball” offers, test-drives, having shoppers take it away to a mechanic to “check it over”, etc. And all of the legal paperwork will be your responsibility. In the end, there is no guarantee you’ll get what you want, either. You may go through all of that for weeks or even months only to discover that your vehicle isn’t as popular as you’d hoped. On the other hand, trading in a vehicle at a dealership is pretty simple. Everything is taken care of for you and you can usually get everything done in one visit. But it is important to know that trade value is based on the WHOLESALE value of your vehicle, not the RETAIL. Remember: the dealer is going to resell your vehicle and will need to make a fair profit on that resale, so don’t expect them to pay retail and then try to sell your vehicle for more than the market will accept. So, the number will be lower, but there is a tax saving on the difference between your trade value and the new vehicle, so the real-world difference won’t be as great as you may think. And again, there is no more convenient way to move from one vehicle to another. If you’d like to speak to someone about your options, call and speak to a Brasso customer liaison. They will be happy to walk you through what may or may not possible for you.